and the still night when it covers with darkness. Your Lord has not forsaken you, nor has He become displeased, and verily the latter state is better for you than the former. Have We not expanded for you the inner heart? and removed from you burden which weighed down your back? ... Surely, with difficulty is ease. There are couple of full chapters in Quran, Ad Duha (93) and Al Inshirah (94) that sheds light on Prophet Muhammad's own spiritual crisis during the time of his Prophetic Mission which can be identified as his experience of 'Dark Night of the Soul'. Worth mentioning that the expression Dark Night of the Soul is used to describe a phase in a person's spiritual life, a metaphor for a certain loneliness, crisis, feeling of being forsaken and desolation. Understandably, Holy Prophet Muhammad, may peace be upon him, even before he received revelation of God, his practice of regular seclusion was most probably triggered from a sort of spiritual crisis. Note worthy that grew up as a marginal orphan who lost both his parents very early in his life. Historically the time before and around his Prophetic mission, it was an age of ignorance (ayyamul-jahiliyyah) in which, generally speaking moral rectitude and the spiritual code had long been forgotten. Superstitious rites and dogmas had replaced the tenets of the Divine religion. His heart was overflowing with profound compassion for mankind and a pressing urge to create unity, eradicate false limiting beliefs, social evils, cruelty and injustice. Growing up in that time and society, surely had created an intense need for higher meaning and purpose which always takes birth in human psyche by going through a crisis and in this case, a spiritual one which led to his deep, exclusive contemplative period. Spiritual crisis is a human experience and Prophet Muhammad also lived all range of possible human experiences. Say (O Muhammad), I am but a man like yourselves...' - The Quran 18:110. When Holy Prophet Muhammad was 38 years of age, he spent most of his time in meditation and solitude. The cave of the mount Hira was his selected place. It is there that he used to retire with food and water and spend days and weeks in contemplation. Nobody was allowed to go there except his wife Khadijah and cousin 'Ali. He used to spend the whole month of Ramadan therein. This pre-revelation period lasted for about 2 years. As Prophet Muhammad's deep mystical experience started with Divine revelation, after some period of continuous unveiling of revelation, it was suspended for a time. This cessation of revelation caused the Holy Prophet to be deeply distressed and grieved. On this account he felt very anxious that perhaps he had committed some error because of which his Lord is unpleased with him. This was a period of "Dark Night of the Soul" for the Prophet on account of his feeling that perhaps he was forsaken by his Lord. Thereupon he was given the consolation that revelation had not been stopped because of some displeasure but this was necessitated by the same expediency as underlies the peace and stillness of the night after the bright day, as if to say: "If you had continuously been exposed to the intensely bright light of Revelation (Wahi) your nerves could not have endured it. Therefore, an interval was given in order to afford you peace and tranquility." This state was experienced by the Holy Prophet in the initial stage of the Prophethood when he was not yet accustomed to receive the intensity of Revelation. On this basis, observance of a pause in between was necessary. By the glorious morning light! And the still night when it covers with darkness. Thy Lord has not forsaken thee, nor has He become displeased, and verily the latter state is better for thee than the former. And soon will thy Lord give thee so that thou wilt be well content. Did He not ﬁnd thee an orphan and give (thee) shelter? And ﬁnd thee lost, so He showed the way? And find thee in want and make thee free from want? Therefore, treat not the orphan with harshness. And him who asks, chide not. And the favor of thy Lord, proclaim. The natural reality of glorious morning light and stillness of night and its darkness is called into attention at the beginning which is interesting because the night is darkest just before the dawn. In the context of any deep "Dark Night of the Soul" experience, its always followed by illumination, like the glorious light of the morning - which is called into attention at the start of this Quranic chapter. Worth mentioning the very words of St. John of the Cross, "... the endurance of darkness is preparation for great light." According to the chronology of Quranic Revelation and also according to arrangement, the next chapter is Al-Inshirah, (also known as Alam Nashrah). Thematically it was revealed to Prophet Muhammad to comfort him during a difficult part of his life into the Prophethood. It consoles the Prophet that his difficulties were not to continue, but would soon be followed by ease and it was a sufficient indication of this that his inner heart was expanded and illuminated with truth, and the great burden which almost broke his back, his deep anxiety for humanity, had been removed by the grant of Divine Revelation to him. 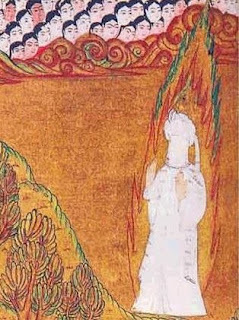 The chapter Al-Inshirah is closely connected with the preceding one called Ad-Duha as both show that the Holy Prophet had suffered great anxiety both from his personal, spiritual inner landscape and also on account of fallen humanity and it was Divine revelation that ultimately took him by the hand, thus guiding his steps and relieving him of his great anxiety. Have We not expanded for thee thy inner heart? And taken off from thee thy burded which pressed heavily upon thy back. And exalted for thee thy mention? Surely with difficulty is ease. With difficulty is surely ease. So when thou art free, strive hard. And to thy Lord turn exclusively. The expansion of the inner heart signifies in fact, as a commentator puts it, 'its illumination with wisdom and its vastness for the reception of what was to be revealed to him.' The burden which pressed heavily upon his back signifies "Dark Night of the Soul" and it was more in a sense because other than personal anxiety / crisis it was also a deep compassion for the state of fallen humanity, comparable to what led historical Buddha to start contemplation how to help humanity transcending suffering. There are other reference in the Quran where in metaphor / parable also expressed the deep state of suffering that was going on inside the heart of Holy Prophet as he struggled to bring light of faith to his own people. Perhaps, you, would kill yourself (O Muhammad) in grief, over their footsteps (for their turning away from you), because they believe not in this revelation. In the life of Holy Prophet, there was another time which is also recorded in the history as a time of deep crisis in his personal and social life. It was the year 619 when he was about 49 years of age he came face to face the death of two closest friends, companion and supporter. It was his beloved wife Khadija who was his dearest and uncle Abu Talib who raised orphan Muhammad and was his guardian and protector as well. And prior the tragic losses, the minority who believed in the Prophet and his message was forced to face a harsh social boycott that lasted for about 3 years. These extremely difficult circumstances and harsh persecution left a very deep impression on him. He was so grieved that he called the year "Amul Huzn" or The Year of Sorrow.